We quickly get inside to safety if there’s a threat of lightning. Interestingly enough, it is seven times more likely that a fatality can happen in a bathtub, for any age, than that someone can be struck by lightning, per the National Safety Council. A Safe Bathroom for SeniorsBathing and related activities are often more difficult for older people, especially those with disabilities. Due to multiple reasons, bathrooms can be very hazardous. As part of my aging-in-place senior living series, I’ll go over some ways to keep your bathroom attractive while giving it a safe, “ageless” design for yourself or for your senior parents. Installing safety features in the bathroom is key to reducing the risk of falling. More than one in three seniors over age 65 fall each year, and the National Institute on Aging (NIA) says 80% of these falls are in the bathroom. Anyone can stumble and fall in the bathroom, but having poor muscle strength and balance is strongly associated with increased risk. Most falls occur while sitting down/getting up from the toilet or attempting to use towel bars, sink tops or other objects to support balance. 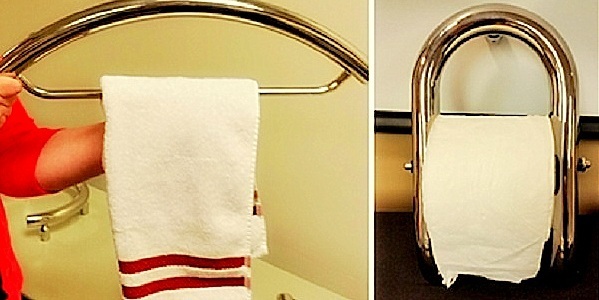 Insufficiently secured towel racks can fall when gripped for support. Jacqi Dix, President of Personal Access Solutions, shares a solution–grab bars can be aesthetically integrated into toilet racks and towel bars. RiskBathtubs are difficult to step over, and sliding shower doors can move unexpectedly when entering and exiting the tub. While walk-in showers are ideal, many are not wide enough. Peggy Mackowski, my CARE colleague and the VP of QDC Quality Design & Construction, ran into this problem with her mother. When Peggy’s mom suddenly found herself needing a walker, the size of her bathroom was inadequate. 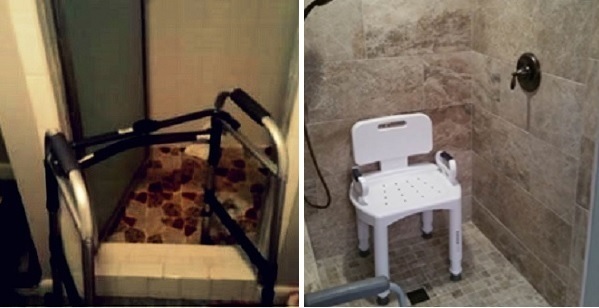 The first photo shows how Peggy’s existing walk-in shower could not accommodate her walker. (Before and After photo at end of this blog. ) The second “after” photo shows how her bathroom was remodeled in the same tight space to have a curb-less shower and a raised toilet with handles–a much safer choice for Peggy’s mom. Recently, I had a discussion with a senior citizen who brought up a problem with the curb-less shower doors swinging out into a bathroom and getting the floor wet. Her friend found a solution of using very thin shower mats, which are available at Target. I belong to the Home Builder’s Association CARE (Council for Ageless Residential Environments), and I asked around to other experts as to why doors do not swing in to reduce water dripping onto the rest of the bathroom floor. I was told that, if the shower area is too small, or that if a person falls, others have to be able to get access into the shower to help the fallen person who might be blocking the door otherwise. In a curb-less shower, also consider a trench drain, where the water will drain backwards into a trench. Textured tiles and special grouts can also be used to reduce water-related risks. There are even more options. I found a list of ideas to increase bathroom safety. 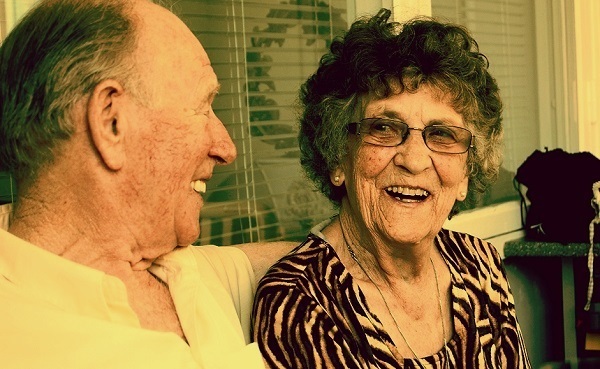 The magnitude of problems older people experience in the bathroom and the seriousness of the situation raises many important factors to be considered. I hope this article and others in my “Aging in Place” series briefly gives ideas and photos for you to consider how to make a safer place to live for your, or your senior family member’s, home. Don’t assume that redesigning your kitchen to be “ageless” is all about grab bars, neutral colors and awkward cabinets. Universal design is beautiful and enjoyable for all. As this concept is becoming more popular, manufacturers are coming out with more adaptable and attractive products. Getting an “ageless” kitchen does, often, not require remodeling. If you find the costs of remodeling outweigh the costs of moving, call me and I'll help you sell/buy an ageless home! When taking on everyday tasks in the kitchen, most seniors face a range of physical challenges. I’ll go over that limitations that are in many current kitchens and give suggestions to make it ageless. Because seniors have difficulty both reaching high and bending down low, store important items on the shelves in the kitchen cabinets and pantry that are between shoulder and knee level. Smaller containers and lighter objects can go higher, while heavier ones, particularly those made of glass or ceramic, should be placed lower down. Roll-out shelves in lower cabinets are ideal for young and old to safely reach items. 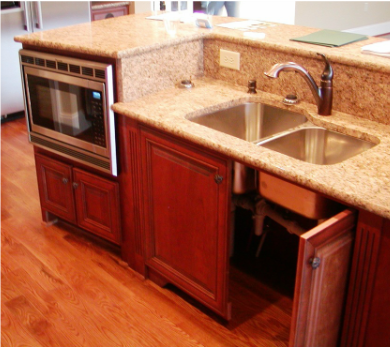 There are many manufacturers of cabinets and accessories for kitchen accessibility. Some have motorized cabinets that move up and down remotely or by crank. Many manufactured cabinets allow bi-fold base-cabinet doors to open fully, providing maximum use of clear knee space for people seated or in wheelchairs. Most stores have items to adapt current cabinets such as Lazy-Susans and full-extension slides for drawers and shelves. For seniors or anyone with disabilities, and particularly for those who use wheelchairs, major appliance manufacturers sell ADA-compliant side-by-side refrigerators, ovens and dishwashers. Stoves at waist level that swing open sideways are much easier on the back. Simply selecting any stove top with the controls on the front reduces leaning over hot, boiling items. Microwaves should go on counters so that they are easy to reach. Taking hot things out of a microwave over a glasstop stove is a recipe for disaster, even for youth. Placing microwaves at or below the counter is becoming much more popular in kitchen design for all households. Microwaves at or below the counter are becoming more popular in all households. My favorite idea is simply installing the dishwasher at knee level or installing the relatively new multilevel two-drawer dishwashers. Elevating the dishwasher allows for loading and unloading without painful leaning over for anyone with a bad back. Creating a “working triangle” of refrigerator, range and sink will allow seniors to move through the space comfortably. You may not be able to remodel your kitchen, but you can provide a more efficient and safer work space by de-cluttering your kitchen (I am a big offender here in my own house). Don’t stack things on the counters and don’t store anything that you use often on high shelves. Any item that isn’t used regularly needs to be moved to a pantry, closet or elsewhere. One idea is to tag every item in your kitchen with red tape. Remove the tape when you use that item. If after six months there are still red tags, that means you should store those appliances or dishes elsewhere, or give them away. The needed items will be easier to find and reach. 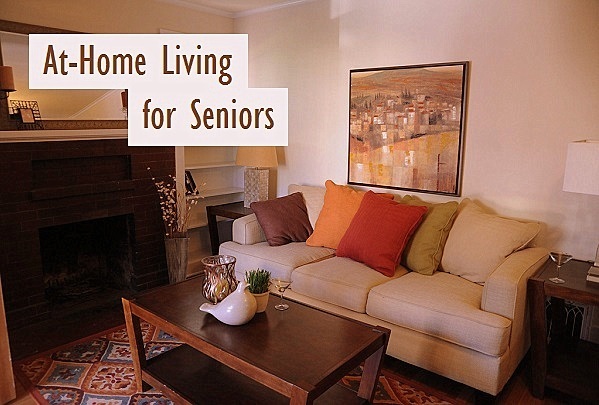 Seniors need an appropriate level of visibility; make sure the kitchen is brightly lit. Ask the gas company to modify the stove to provide a gas odor that is strong enough to alert seniors if the pilot light goes out. Any timers or smoke alarms should be set at a frequency and volume that seniors can hear. Electric can openers and special faucets/cabinet hardware/handles can help. Because many seniors have strength issues, cabinet hardware that can be pulled is preferable to knobs or anything requiring twisting. Kitchen sinks and doors with single lever faucets are easier to operate. The terms accessibility and universal design have become buzz words so that every room should be accessible to every family member. The very young and the very old are the most apt to have trouble navigating the kitchen…especially when they are hungry! According to the MetLife Mature Marketing Institute, of that group, 49% want to stay in their current homes and 38% want to move to new homes. Unfortunately, most of those homes seem to be built for Peter Pan–where no one grows old or needs spacial accommodations. Staying at home is not always the best solution for every senior care situation, especially if the home environment is unsafe or if intensive medical attention is required. Let’s discuss the safety factor of “aging in place.” In future months, I’ll report on various tools, features, remodeling modifications, and technology to make aging in place possible. I found it very surprising that eighth on their list is dangerous bathtubs or showers, since an AARP report has bathroom aides (like shower rails) listed as the second to highest desired remodeling feature by seniors. Many of these features do not currently exist in most seniors’ homes. PoisoningThe National Center for Injury Prevention and Control (NCIPC) states that another top cause of home injury for seniors is poisoning. The majority of poisonings in older people are unintentional and may result from dementia and confusion, improper use of the product, improper storage, or mistaken identities. Seniors need to make sure that their prescriptions are stored and taken correctly not only for themselves, but for others, too. The Alliance for Aging Research concluded that, in 38% of child poisoning cases in the ER, the medicine belonged to a grandparent. Cognitive StateThis brings up the issue of cognitive state. Something as simple as an occasional missed pill, forgetfulness, or another significant cognitive change requires attention now. This US Department of Health & Service lists “what you can do” suggestions for this and for many other senior health literacy topics such as hearing, strength, and visual challenges. So, even if a senior citizen can’t drive, aging in place is still possible if other safety considerations are taken care of in their home. Until Next TimeEach month, I’ll contribute an article about various housing options for seniors. Future discussions will also discuss financial considerations and many tools and modifications possible to improve current homes, new homes, or even your family’s home for a parent or other aging loved one. Starting the Conversation About the FutureWe might fear resistance, silence, or conflict when talking about aging and the unknown future, but we should fear a crisis more. Unexpected health emergencies or accidents that result from a lack of proper planning can negatively impact several generations. Small, simple conversations are a great way to start preparing for the unknown.